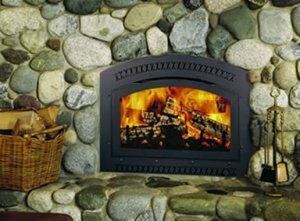 Nassau County fireplaces: whether you need electric, gas or wood-burning	fireplaces, we have what you need. There is nothing like a warm, crackling fire to make any house a home. Most fireplaces today are used more for their aesthetic value than for	warmth, but if you’re looking to keep your house warmer through	those chilly winter days or a power outage (if you’re using a non-electric	stove or fireplace), we have plenty of options and accessories to keep	you nice and toasty. Have a look below to get a taste of all we offer,	and be sure to stop by our store or call (516) 821-0453 if you have any	questions or concerns. This is the simplest and most convenient way to add the ambiance of a fireplace	to your home: all you need to do is pick out the model you want, bring	it home, plug it in to a standard 110 volt outlet, and voila! Your fireplace	is installed and ready to go. Plus, you don’t need to worry about	carbon monoxide or excess heat coming from the unit. However, if you’d	like your fireplace to keep you warm, you can turn on the 5,000 BTU blower,	which comes standard in all of the fireplaces we sell. If you’re looking for a real, burning fireplace but don’t want	to deal with the hassle of a wood-burning unit, you want a direct vent	gas fireplace. With a push of a button, you’ll have the fire you	want in seconds. You can use natural or propane gas, and if you’re	looking to warm your home, they have about 80% efficiency. They do need	to be vented, but the venting need not come out of your rooftop, as with	a wood-burning fireplace. 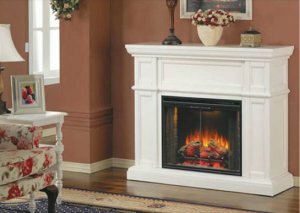 You can also purchase an electric blower to	spread the heat throughout the room, and our gas fireplaces come in a	wide variety of styles to match virtually any décor. 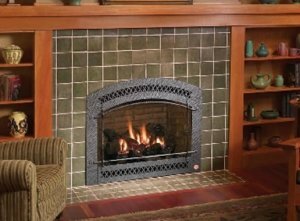 We offer direct vent gas fireplaces from Martin, Avalon, Lopi, and Fireplace	Xtrordinair. For the authentic crackle and wonderful aroma of a real fire, there’s	no substitute for a wood-burning fireplace. You will, however, need a	chimney to vent the fireplace out of the roof of your home, so installation	is not as simple as with electric and gas fireplaces. You will also need	an electric blower if you want to transfer the heat throughout the home	instead of up the chimney. However, with the many different glass styles	available, your fireplace is virtually guaranteed to complement your décor,	and the beautiful look and aroma of your fireplace should keep you happy	for years to come.